Making a great first impression is crucial for every smartphone manufacturer. Jolla is aware of this and has turned special attention to the starting point of every smartphone ownership - the retail box. It's very well designed and unlike any retail box we've seen - it actually displays part of the code of the Sailfish OS fading away into a white background. Pushing the inner box from a special cuthole reveals a special The Other Half back cover (more on that in a second) painted in bright orange that proudly says "The first one". The rest of the accessories include a standard microUSB cable and an AC adaptor that outputs 1A current. Jolla has also included a couple of black and white stickers that make the whole experience a tad more special. Headphones were noticeably missing from the package, which was a bit disappointing. With the sort of price tag Jolla chargers, we certainly should have get a headset and probably a microSD card too. The Jolla measures 131.0 x 68.0 x 9.9mm, which makes its footprint more or less on par with other smartphones with 4.5" displays. However it's not quite the slimmest and at 141 grams not too light either. You do get the nice solid feel that comes with extra heft, but portability isn't the best for the class. Check out the Jolla from every angle in our 360-degree spin below. 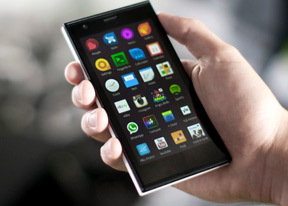 The Jolla has a very intriguing design that's definitely appealing. Since the junior phonemaker is made entirely out of Nokia renegades that keep the MeeGo spirit in their hearts, the Jolla ought to be a worthy successor to the Nokia N9, which calls out for a solid built quality and cool, innovative design. We are happy to report that the Jolla delivers. The phone sports the so-called two-half design - Jolla frequently refers to each of the halfs as "pillow". The front half, which holds the phone's internals, is made out of aluminum. The second half is actually the back cover and is made out of plastic. Thankfully, it's of the premium kind and complements the aluminum well. As we mentioned earlier, this is the "Other Half" - each Jolla back cover is equipped with an NFC chip. Once snapped into place, the chip communicates with the phone, and the phone can apply a major user interface overhaul every time a new back cover is snapped. Our only gripe with it is that it's a bit hard to remove and makes an unpleasant cracking noise when you peel it off the back. Anyway, the difference in the choice of materials used for each half makes for an interesting design. The unfortunate downside to this design is that it makes the Jolla a bit thick. It's not necessarily a deal-breaker, but it might turn some people off. The front of the Jolla is particularly beautiful, as the glass of the display wraps around the sides of the aluminum. It's not just a design treat, as this makes swiping sideways gestures more comfortable. The edges of the Jolla are sharp and the phone looks quite boxy from the front. It's not too bad though, as the chamfered sides break from the boxy-ness that the Jolla exudes. Thanks to the aluminum construction, it's as sturdy as a phone can get and nothing squeaks or twists. Due to the significant gap where the halves meet, the Jolla is very comfortable to hold. Your fingers naturally rest there, which greatly improves handling. The back, as we mentioned, is made out of premium plastic, which is nicely resistant to fingerprints. In fact, after prolonged periods of use, we didn't even have to wipe the back. The front, on the other hand, is quite easy to turn into a greasy mess.